Area: The trailhead and first half of the trail is in the Smith River National Recreation Area. 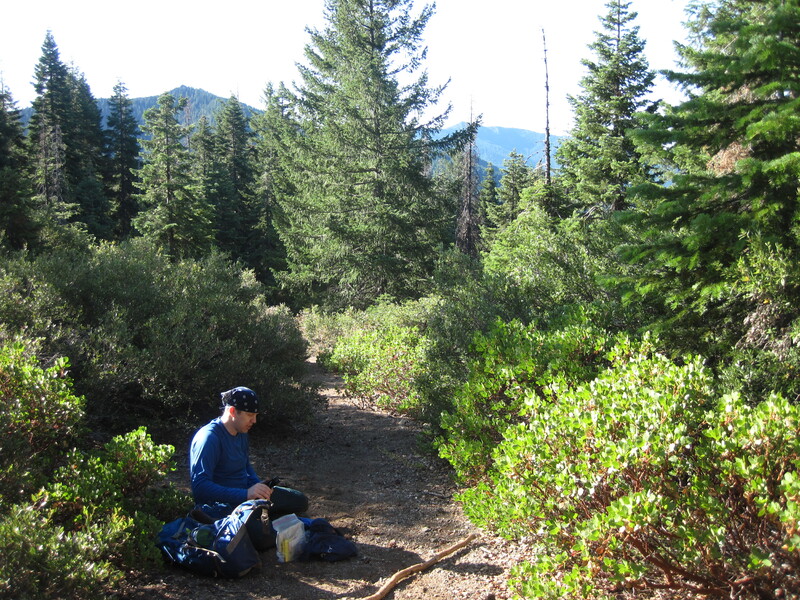 The last half of the trail (3 miles) is in the Siskiyou Wilderness. Special Note: If camping at the lake, be sure to camp on durable surfaces (not grass or vegetation) set back as far as possible from the lake and use pre existing fire rings. Bury human waste at least 100 feet from water in a hole six inches deep. Pack out all toilet paper and trash. Directions to Trail head: From HWY 199 take Little Jones Creek Road (FS 16 and 17N05), just north of Patrick’s Creek Lodge. Follow the blacktop about 10 miles to the Bear Basin turnoff (16N02). Turn left on 16N02 and follow the winding, gravel road for about 2.5 miles and then turn right on road 16N10 into the parking lot. Road 16N02 may be closed in wet weather to prevent the spread of Port Orford Cedar disease. Late Spring, Summer and early Fall are the best times to walk this trail. Check with the Gasquet Visitor Center for more information. Drive ½ mile farther up to the Doe Flat Trailhead for a toilet; there are no services at the Island Lakes trailhead. The Island Lakes Trail is one of the few Smith River National Recreation Area trails that include a subalpine lake as its final destination. This trail leads hikers through several different forest types and climbs steeply to a roughly 10 acre high mountain lake. Along the way are outstanding views over the Siskiyou Mountains including one sweeping vista where both Bear Basin Butte Lookout and Ship Mountain Lookout are visible. It is similar to the Doe Flat to Devil’s Punchbowl hike, but you are less likely to see anyone else at the beautiful Island Lake. 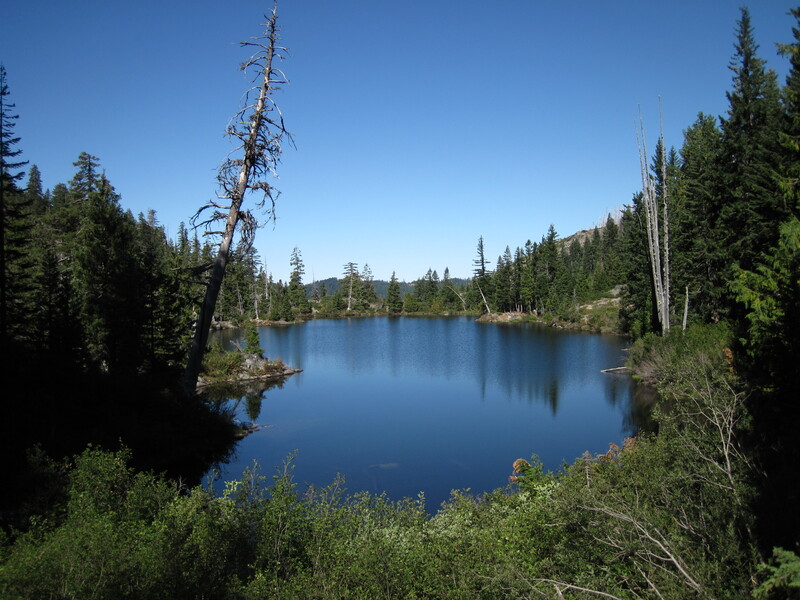 Island Lakes Trail begins within the specially designated Bear Basin Butte Botanical Area. This area is one of four Botanical Areas included in the Smith River National Recreation Area, which is part of the Six Rivers National Forest. This botanical area contains a rich mosaic of vegetation types and species, some at or near their range boundaries, such as Alaskan yellow cedar and the endemic Brewer’s spruce. The mixture of California and Pacific Northwest montane species gives the area its unusual character. The diversity of conifers is amazingly high with fourteen species found within this Botanical Area. In the first three miles, the trail drops about 1,000 feet, to an elevation of 3,000 feet, where it intersects the upper reaches of the South Fork Smith River. These first three miles were once a dirt road and it remains wide, relatively clear and perfect for mountain biking. On a bicycle, you’ll roll downhill past vine maple and towering Douglas Fir trees, without having to pedal the entire three miles. The road ends at large clearing with a campfire ring and the junction of the South Fork Smith and a small tributary creek from the Bear Basin Butte drainage. Stash your bike here and take a moment to enjoy the music of the stream and the little pools of clear, cool water. Five or six steps across slippery rocks in the fledgling South Fork Smith River and you move from the Smith River National Recreation Area into the Siskiyou Wilderness. 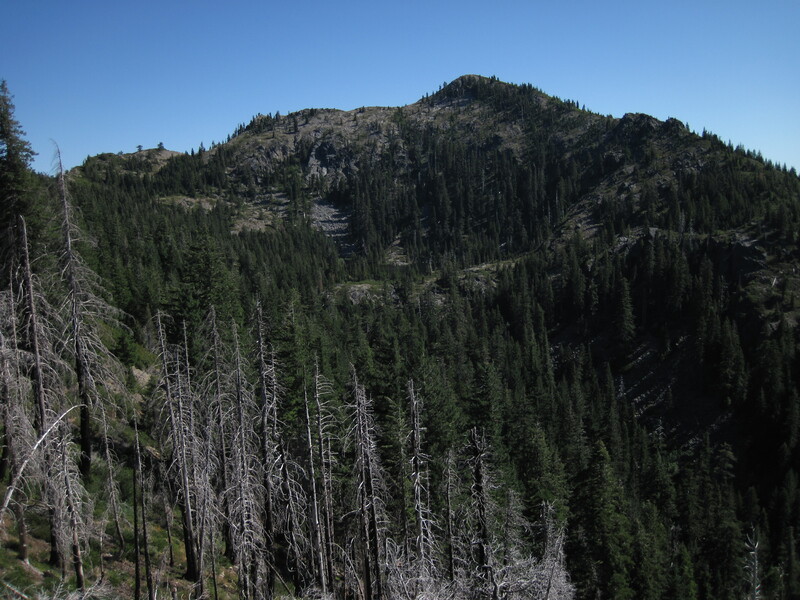 The Siskiyou Wilderness was designated as a wilderness area by the California Wilderness Act of 1984. 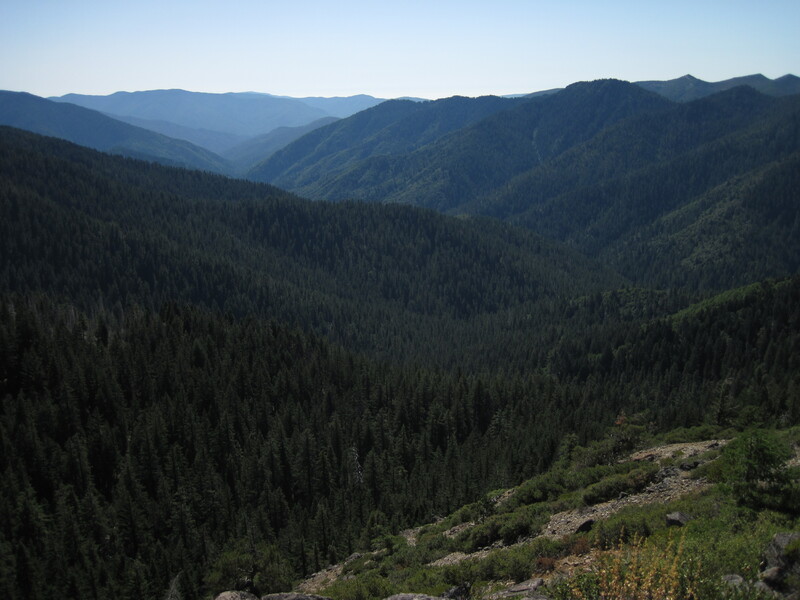 It spans three national forests: Siskiyou, Klamath and Six Rivers for a total of 182,802 acres. It is one the richest temperate coniferous forests in the world. Much of its extensive biodiversity is due to the fact that the region escaped extensive glaciation during the most recent ice ages. From the Wilderness boundary, the trail climbs steeply for nearly three miles up a loose dirt trail under a canopy of sugar pine, Douglas fir and tan oak. At the final climb to the first sub-summit the understory vegetation of huckleberry and salal disappears almost completely and enormous sugar pines have left their calling cards of giant cones scattered on the ground. Some of these trees are too big for even three people to wrap their arms around. As the trail gains the first summit the landscape changes to subalpine, sculpted by more exposure to wind, snow and cold. There are fewer and more dwarfed trees and Manzanita bushes. The first summit is a great place to stop for a break and take in the first views you’ll see from the trail. From the sub-summit the trail dips again across a saddle before ascending the final 500 feet of elevation to the Lake. On the final approach to the lake the trail ascends a rocky ridge and enters a ghostly forest where the lightening sparked Jedediah Fire burned 86 acres of forest in July of 2007. 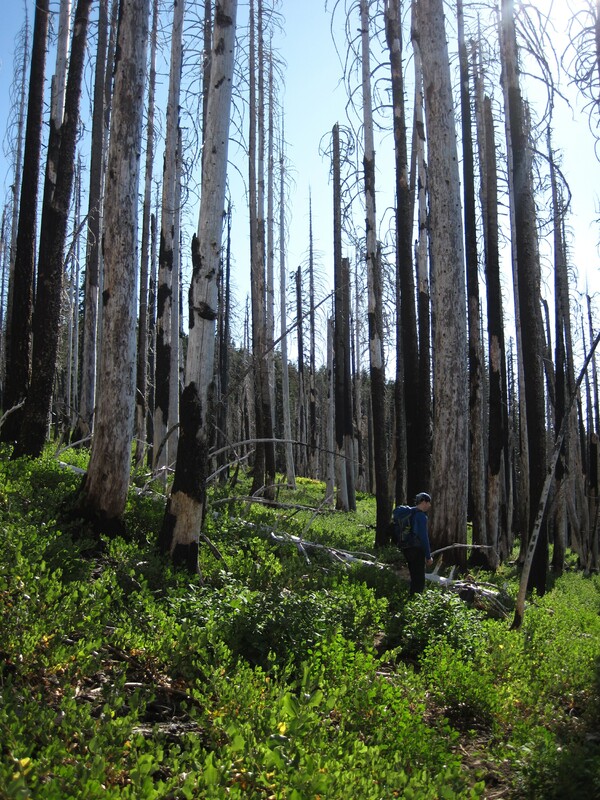 The burned forest contained mostly white and red fir, Douglas fir, and huckleberry. The contrast between blackened skeletons of trees with new undergrowth of California native blackberry is strikingly beautiful, and in late summer, the berries are delicious. From the end of the burned area it is a half mile farther to reach Island Lake. Island Lake is about ten acres and does indeed have a small island on one edge. The banks of the lake have been heavily impacted by campers so leave no trace practices are mandatory. Habitat around the lake is delicate sub alpine. Even though the trees and shrubs are small, many of them are hundreds of years old and would take the longest to grow back if cut or damaged. The small size and shallow depth of the lake allows the water to warm in the summer sun, and the lake has a few places where rocky edges make nice entry points for swimming. If you watch patiently and quietly at the edge of the lake, you may see some of the lake’s residents, like the rough skinned newt. The newt lives in Island lake but avoids being eaten by fish because it contains a toxin that will paralyze and kill fish if eaten. The bright orange underside of this newt is a warning flag of the poison it contains. The rough skinned newt also lays its eggs in water, but instead of laying them in mass like most amphibians, it lays eggs singly and hides them in submerged vegetation to avoid predation. The lake has been stocked with non-native trout. Introduction of non-native fish to high elevation lakes often leads to the extinction of native amphibians because the fish eat both the eggs and adult amphibians. In Island Lake the rough skinned newt is one of the only amphibious survivors because of its habit of hiding eggs and its toxicity. From the east side of the lake you can glimpse a view of Blue Ridge above the South Fork Smith Basin through the noble fir/Douglas fir/ Brewer’s spruce forest. The east edge of the lake is a talus field of boulders that has crumbled down from Jedediah Mountain (5728 feet). Island Lake is a peaceful and pleasant place to pass a sunny afternoon with swimming, gazing into the tree tops of giant firs and lounging on the rocks watching wildlife. The return hike is fast as the first 3.25 miles are downhill, but don’t forget to save some energy for the 3.25 mile climb from the South Fork Smith back to the trailhead.